I grew up attending church a lot. I was in a church classroom a lot. When I was a kid, my family attended Sunday morning, Sunday night and Wednesday night preaching and prayer services, plus Sunday school, plus missions education programs and Vacation Bible Schools. But… I didn’t grow spiritually, didn’t really experience spiritual depth and didn’t really learn what following Jesus looked like outside the walls of the church. When I hit adulthood, I started to grow spiritually, but I would say it was still rather slow going. I started attending church with my wife and soaking up biblical knowledge like a sponge. I entered ministry and attended Bible college and developed the spiritual disciplines. But something was still missing. I walked through pain—depression, specifically. I began to repent of pride, self-centeredness and other sins. My wife and I began to have tough conversations. I went on staff at a church with a strong culture of discipleship. We joined a small group of people who cared a lot about doing life together. The local church, as a community of believers, was always integral to Jesus’ plan for discipleship. The local church should balance the five purposes of worship, evangelism, discipleship, fellowship and ministry. The local church should also be balanced in ministering to the community, the crowd, the congregation, the committed and the core. If the local church is going to facilitate discipleship, it has to be more than a classroom. It has to be a community of people who are coming to know Jesus together and serving one another for God’s glory. In the last few years, we haven’t gotten everything right. In fact, I think it would be easier to write about our mistakes than our success. 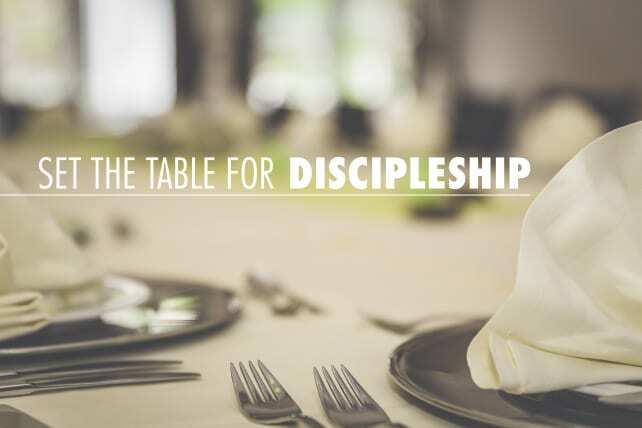 But I’ve watched our staff and volunteer team make disciples well, and I can point to at least six specific ways we’ve been setting the table for discipleship to happen. 1. From the pulpit, a vision is cast and an example is shared about the role of spiritual disciplines. It’s not just about conveying information in a “deep” sermon format. It’s about creating a hunger and getting practical in terms of how each message should be lived out, and how every person can go deeper beyond Sunday. I spent 15 years doing deep, expositional preaching, but failed to call people to really develop their own faith at home. One of my newer goals is to help people, through my preaching, to become self-feeders by talking about the value of the disciplines as well as the how of them. 2. Lay counseling and counseling-as-discipleship is utilized to disciple people through crises. We must develop a culture and a system for involving people in the messes of other people. The broken-and-healing need to be pouring into the broken-in-need-of-healing. And the most effective counseling we can do is essential discipleship. Some of the best marriage counseling we can do is having a man disciple a husband and a woman disciple a wife. I’ve learned to lean heavily on my wife, Angie Cox, an LCSW and a master at empowering lay people for counseling. 3. The importance of micro-groups or groups-within-groups is talked about. It’s usually when a group gets smaller that real discussion happens. This happens when men and women divide during group time. It also happens when two or three from a group grab coffee to get more personal. So we encourage group leaders to encourage group members to get together beyond the weekly meeting to dive deeper into specific struggles. 4. Everybody is challenged to join a ministry team. A ministry team is like a cohort of people who are in proximity to each other as they serve. This creates an atmosphere for on-the-job discipleship. People sharpen one another in the trenches together, so we let ministry teams function a little bit like small groups. It’s been thrilling to watch people sharing their stories and challenging one another while serving together. 5. Schedules are simplified and families are encouraged to do discipleship at home. Some of the most important discipleship work that a church can do is by empowering fathers, mothers and guardians to make disciples of their kids, as well as their neighbors’ kids. We fight against busyness so that families have time away from church together. 6. Pastoral ministry becomes personal ministry carried out within small groups. Groups are challenged to provide care for one another. People pray over fellow group members before or during crises, deliver meals, and keep tabs on one another. No promises are ever made that the church staff will be doing “pastoral ministry,” even though we often do. We don’t do any of these perfectly, but where we see them happen, we see them working. And we hope to do more of each of them. Jesus never intended us to try to carry out the work of disciple-making while ignoring his primary engine for the task—the local church.